Well, howzabout that then, guys and gals? For eleven years running, with Mrs. Thatcher. The fluorescent DJ and the Tory Milk Snatcher? While he’d pant and jabber in his non-stop pop lingo. Goodness gracious. What they put up with – him and Di. Who’d be royal, eh? But who do they come to for marital advice? Yours truly. My way, you see, of telling you not to say a word. I could fix it for you to meet our lovely Queen! That he’d “have to earn it”, then how – then to keep quiet. “I was petrified. I just sat there thinking, ‘Why me?'”. And instead Margaret Thatcher is the Tory party’s toast. She profited from its corpse, then called it progress. 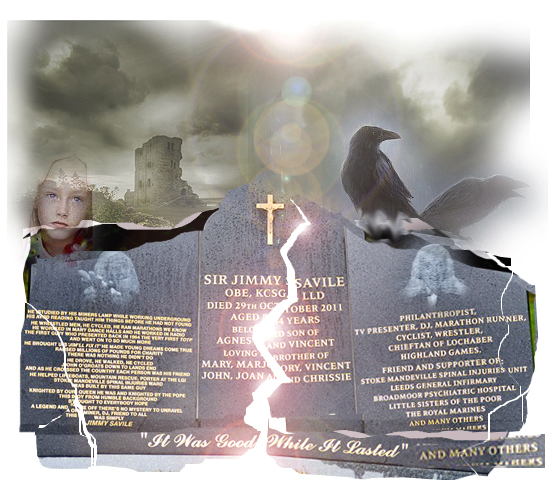 This entry was posted on 18 October, 2012 in homepage and tagged Alan Cox, Claire Palmer, Heathcote Williams, Jimmy Saville, Margaret Thatcher, Prince Charles. Bookmark the permalink. Fantastic! Love the line about millions more suffering child abuse at the hands of Thatcher. Bang on me old codger.What a mess.Do we need an English Hitler or perhaps an English Stalin to clean up this mess…because if this is Democracy then the Greeks deserve all that they are getting now.Its time the people took to the streets and demanded a clean sweep .Go get Cromwell’s skeleton (if it still exists) or perhps we need Guido to do it . The unholly alliance of Big Business,the City and venal,corrupt politicians will lead this country to anarchy …we already got a whiff from the kids rioting.Next time perhaps it won’t be the kids …and the extremists in our society are just rearing to go to exploit what divides us and tearing apart what unites. After all Hitler got elected .It won’t be long.Meanwhile the Chinese rub hands together…happy with the future demise of the EU knowing that it will be much easier to pick us off one by one.